An inquisitive being with the strangest personality problem. "Those that exist beyond our concepts of time and space, neither angel nor devil... we call them Outsiders. They possess bizarre and terrifying power, bending the laws that bind our world together and at worst breaking them condemning us into chaos. They are said to eat dreams, concepts, ideas, the fabric of space, even nothingness... absolutely absurd, isn't it? They are even said to possess the powers of creation and destruction. It is said that upon death every trace of their existence, every influence they made, even memories disappear. Sad if it is true, to have all that power, then die and the universe forgets you. I wonder if that is why so many become heartless. But not you are different, aren't you, Owru?" Physical Description: While details can varie depending on what form she takes, for most of them she is a four armed being with three fingers per hand, three eyes, a long neck, a set of antennae, a smooth body of unknown translucent composition, a strange cloak-like membrane that protrudes from her back that she can wrap around herself, and long feet with two toes each. There are differences, however, on which part of her is in control at the time, these being her other "selves" that consist of her psychological components. Nuelle: Appearing as a pale young woman around the age of 20, standing at around 5ft dressed in a runed white hoodie made up of her cloak featuring a set of three yellow eyes on the hood that obscures half her face, white bangs hang down the sides of her face, the only visible signs of anything higher than her nose. This form looks human, and breaks the convention of her other forms. Owru: A strange alien-like creature with a smooth creamy white body, three pure blue eyes, and runes on her chest and stomach. This form represents her ego. Has characteristic cloak/cape growth. Chuza: More humanoid, angel-like, with two arms with four fingers each split to have white on top and black on the bottom that split into four two fingered hands. Laadan: Larger, more colorful, and more bestial version of her Ego form. Dark violet in color, with a longer face, forked antennae, bright green eyes, a black tongue and gaping jaw, a ripped-looking "cloak", and white goopy "tufts" on the base of her neck and wrists. Laadan seems to have trouble with focus, leaving to have a nearly transparent body that leaves behind a puddle trail as it "melts". The puddles dissipate afterwards as if they were never there. 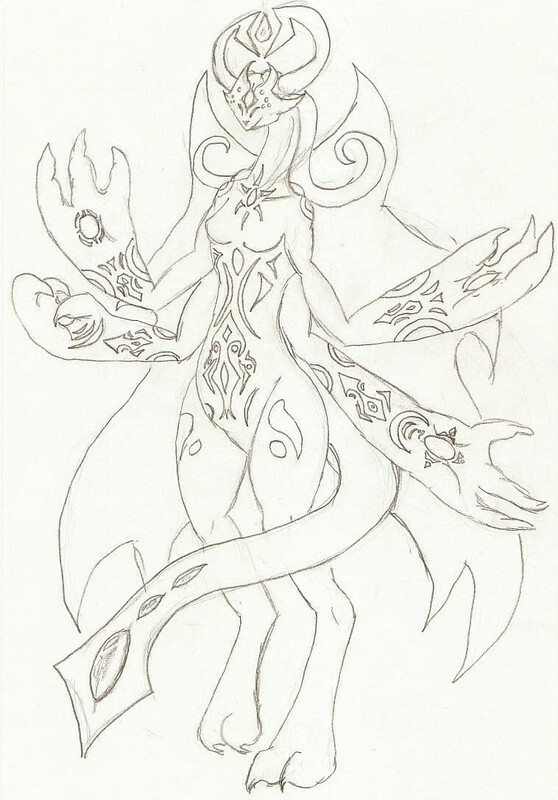 Zilthai: She resembles Owru's ego in size and shape, but is more intimidating, being black with glowing yellow eyes behind a mask and glowing blue runes upon her body. Personality: Inquisitive and friendly but yet quiet, lonely, and sheepish, she's an odd being with a penchant of getting into anything and everything, and a desire to know how everything works. She could be described as something like a child with her curiosity and need to tinker, but something beyond a genius with the well of knowledge she seems to possess, and yet can also be clumsy and naive. She shows no desire to cause harm, or to be harmed, reacting to emotions around her. To complicate matters, however, while as Nuelle and Owru all this is true, her mental components can sometimes take over and they have their own personalities and names. As Chuza she is somewhat cryptic and meditative, behaving more mature and desiring peace with limited action. The pursuit of enlightenment through knowledge and greater good prevails over simpler desires. Chuza sees violence as something done by troubled creatures who have yet to reach enlightenment, and shows a desire to lecture and teach them the way. She can come off as arrogant and idealistic, but well meaning. As Laadan she is wild and uncivilized, acting off emotion and desire more than deeper thoughts and rationalizations. She can behave more like a child than normal, and can be very clumsy and ravenously curious. Is also a glutton, eating and drinking whatever is consumable lying about, and sometimes things that only look consumable like fruit displays. While aggressive when agitated, she is normally more a nuisance than a danger and tends to be more better described as overstimulated. As Zilthai she is paranoid, aggressive, and depressive, representing the various darker feelings that Owru bottles up deep inside and forgets. She obviously does not show up as often, making her appearance even more dramatic. Zilthai finds it hard to trust anybody, even her psychological counterparts, as she sees many ways in which she can be hurt and betrayed, and bottled back away within the recesses of Owru's psyche once more "like an unloved child". She shows a great desire to be recognized and known, even if that means being feared as a result. Being forgotten to her is something worse than death. Equipment & Abilities: While not possessing much in the way of... possessions, she does have many odd abilities, all a form of strange melding of mind and magic. First off, obviously, she can change shape, stretch, and switch between her various psychological aspects. She can phase through solid objects like a ghost but can't phase through energy fields. She possesses a vast amount of knowledge like a dictionary being able to say what something is, but lacks much knowledge in the "how" and "why" creating her curiosity. She possesses strange energy based abilities, like being able to push things back despite her exceedingly light weight, or manipulating non-living matter near her like some psychokinesis, and levitation. She can also recede back into her inner world of Nod as well as pull people in with her. ...less useful abilities are that she can project her image, throw her voice, and do great impersonations of people and animals. Historical Background: Her history is actually rather recent, not existing for over the last few years or so. She first existed in a place she referred to as a "deep dark cold" which later she forged into her own little pocket world of Nod where she started the formation of her "self". She already possessed a lot of information with no knowledge of how it got there to begin with, nor the knowledge of how and why she exists or what manner of events lead to her creation. The lack of people of whom she could interact with other than her other selves also made her lonesome and desperate, so she wandered outside her reality and out into others in order to fill the void of her being. In her hardships and confusion in these other places she also fed Zilthai, her shadow, who has caused troubled in some places. Stories spread of a maniacal shadowy supervillain causing destruction, attempting a campaign of conquest. Nobody that knows that Zilthai and Owru are one in the same, nor have seen her enough to draw that conclusion. High above the Imagiverse Centre a disruption ripples softly across the sky, subtle enough enough at first to not raise an eyebrow. Proceeding this is a darkening the area and a series of blue marks forming a circular symbol in the air then lighting up, a symbol like a small blue sun with a black hole for its center. From the center of this sun emerges a head, a head wearing a strange blue mask, tiny holes where eyes would be, a faint ghostly yellow glow leaking from them, in the center an exposed third eye stares out. Two horns stemming up from the mask spread out and converge at a center point, a single glowing blue "fire" held adrift between them, and laying down and curling, wiggling softly were two black antennae-like protrusions that pulse softly from within with a cold blue glow. Overall a head barely recognizable as something one would call "human". What follows next is the formation of what appeared to be a cloak of midnight blue and then a long lithe black fleshed body from that, almost vaguely effeminate, with two toes on each long foot, three fingers on each long hand, each hand attached to four arms. This body was translucent, slick, hairless, undefined in detail and a pattern of glowing blue markings upon it. Much like the antennae, a soft cold blue glow emanates from within, around where a heart would be. A tail hangs down with three blue eye-like protrusions and a broad and flat tipped tail. Occasionally these eyes, eerily enough, seem to actually move. The being floats there, quietly observing as the disruption closes behind her. Her eyes narrow and she wraps herself in her strange membranous midnight cloak. This strange being has come to be known as Zilthai, the shadow of Owru, hailing from an unknown point outside known reality. "Look, sisters, at these beings as they meander about, content in their assured existence, blissful in their comforts, careless by their whimsy," her voice echoes spitefully from within her. "And look at us, we who were cast out as rejects, like flakes of dead skin, denied of purpose, starved for reason, regarded as worthless refuse! Are we no less than they, are we not in fact greater?" With this she descends down like a swirling blue and black comet as her cloak flaps, then stops abruptly on the street with not even a sound as if her impact carried absolutely no weight. Under her, however, the ground briefly dips in then wobbles back like jello, the space disrupted lightly before the effect dissipates. Ignoring the onlookers she shifts focus to the various travel points. She waves one hand across the portals, as if to hope for the choice to present itself to her. "No point now to fight it, we are just a puppet of fate, after all, doomed to never know if we even truly exist. Ours is only to be directed to the next destination." The Imagiverse had plenty in store when it came to surprises, and Max wasn't out on that. The portal to Robloxia had the recurring theme of cubes, the portal a rectangle consisting on blocks of different textures, from metal grids to smooth metal. The quicksilver within the rectangle frame of the portal rippled, out stepping from it, a Robloxian. The heavyweight cuboid man wore a simple black shirt, with an angular R on it. One short sleeve was ripped, producing a metal arm, running on a simple matter of joints. Two ecclipical beads were in place of his eyes, his teeth when he smiled a sparkling white. "Well, well well!" cries the cuboid man. "I've never seen the likes of you before! John would kill me if I tried to fight something I only met, so I ask you a simple question: Friend or Foe?" A sound comes to Zilthai, an exclamation in her general direction as it seemed to be. Her multifaceted vision caught focus upon the source of this disturbance without her having to turn. It was a cuboid being, another absurdity that no longer surprises her, one who would rather choose a more aggressive response to her presence but holds back under loyalty to a higher order, one under the name of John. The being then posed a perplexing ultimatum and calling it simple. She taps together the fingers of both sets of hands in contemplation as she finally turns towards him. "Friend or foe," she repeats, her voice smooth and clear, but strange, like it were being projected, but more organic than digital, and there was a level of power in it, and unease it could cause. "Friend is a comforting concept, is it not? The acquaintance with others whom acknowledge and value your very existence is a very attractive concept, I admit. But I do wonder on what extent it is real? Is it not in the end a means to attain what one desires, that being one's own sense of importance? How perplexing, but if forces that be guide me as such then I have no choice but to comply. And foe, an being of which opposes you, that you may have enmity for and must overcome or destroy. I cannot make that assessment as I do not even know your beliefs and morals to weigh such as a viable answer." She pauses, realizing the introspective will likely be lost upon this being. The tapping of her fingers ceases and cranes her neck. "I am Zilthai of Nod, one of four, and it appears fate has guided me here. And at this moment, unless you choose otherwise with your believed free will, there is no point in hostility, she says coldly, dismissive of Max's individuality but also lacks compassion for even herself. "However, at least one among my other three shares in your carnal sentiments, you could consider that one friend." She looks about once more with all her eyes, awaiting an event yet uncertain what that was. She held a hand to her chest, she could feel the others inside struggling for control, attempting to pull her back within Nod so they may assume control. "For now I await the shift to move me to my next destination, or one of the other three to take my place." Max decided to take the long and, to his rather squat vocabulary, confusing monologue as a "friend". The alien being looked like one of those types of extra-terrestrial beings who consider themselves above mortal morals, although said morals also apply to the higher entities like the gods, and the Creators, who aren't as benevolent as they sound. Although the mention of "one of four" intrigued Max, who could put two and two together to guess this was also a being of a schizophrenic persuasion. It kind of reminded him of John, who was a few fuses short of a circuit breaker, in his opinion, and everyone elses, including John's own brother, Adam, who was, to be frank, the dim one out of the Chosen Ones. Funny the thing mentions Fate, because Max is getting the feeling the same entity is trying to make things interesting for the strongman Robloxian. "Well, Zi-leh-thigh," said Max, trying with apparent difficulty to get out the alien syllibles, "It's nice to meet you. I am Max the Robloxian, one of the Chosen Ones, basically a group of misfit heroes who were picked to protect the Imagiverse from any demonic threat. As it seems you're the negotiable type, I will say you don't fall into the demon type, whatever you are." He would take a wary step towards Zilithai, hoping he wouldn't provoke the entity more than is necessary, and spread his arms, as to indicate their surroundings. "Welcome to the Imagiverse!" said Max with a voice that would have filled a cavern with it's enormity. "Realm of the Imagined and home to worlds that can only exist in a universe that's pumpin' with Imagination!" "From the Land of Nod to the realms of imagination," Zilthai responds, yet it seems not directed at anyone in particular. "Fitting for an undesired sentiment." Her eyes gaze off, emanating their yellow haze, unblinking, the lack of pupils and facial expressions making it no easier to read her. Inside she pondered the concept of misfits fighting evil. Misfit in particular was a word she hooked onto. That is what Owru was, an outsider that no one even acknowledged to exist, a fate far worse than being hated. The concept barely crossed her mind that others may share this fate. "Perhaps I am in fact fated to meet these Chosen Ones." "Well, if that's what you want to do," said Max, "Than I can get the others to come here." His expression could be compared to a lucky fisherman who wanted to share his latest catch with his fellow fishermen. He would raise his robot arm, it's palm facing up, and press some hidden mechanism. A panel that covered the entire palm would spin, revealing another set of buttons on the other side. He would press several of them in order, and then raise the palm to his ear, or where it could have been. A series of slightly prolonged beeps would emanate from the hand before Max would speak again. "Yeah, I would like to send an audio message to the Chosen Ones.... alright, I'll hold..." A few seconds pass before he talks again, this time slightly louder. "Hey, guys, guess what I came across in the Centre. Some alien thing from Nod. Don't ask me what that is, for all I know, you could ask John, he seems to know everything. Just come over, alright? Thanks." He would press the palm again, the panel spinning again to it's original orientation before he would turn back to Zilithai, smiling. "Sorry about that. Just sent a message to the Chosen Ones, so hopefully they will get here in a few minutes. While we're waiting, tell me more about this "Nod" place." Zilthai points to a circle right below her neck, the mark while seemingly at first as a tattoo is in fact some kind of strange hole that displays a series of brief glimpses into another world. From within, what could be seen, was some form of surreal dreamscape of floating landmasses, a cracked moon leaking out a waterfall, ruins and structures from various eras including a gothic style clock tower half submerged in a lake, running backwards and forwards without any clear reason. Most outstanding was a giant white tree that extends into the depths and into the heavens. Below the landmasses was layers of orbiting landmasses and a deeper and darker region obscured by a thick dark cloudy haze, flashes of blue light hint at turbulent storms. All of a sudden a flash of light emerges from the gate cutting her off abruptly, followed by a massive slimy violet three-fingered hand clenched into a fist bursting from the tiny gate filling the air with shards of light as if some ethereal glass was shattered. Another figure begins to emerge from the gate, and as it does so, Zilthai begins to collapse in upon herself, and dissipate rapidly into a dark haze sucked into the cracks of the gate. "Laadan," was the only thing Zilthai could utter before the other figure completely replaces her falling on the floor before Max, a larger and more feral looking creature, similar but not the same as Zilthai, with a body dripping and near transparent like it were made of slime. In ways the new creature was more ornate, colorful even, with tufts and a larger more fanciful cloak/wings and forked antennae wiggling in the air. The first set of claws were larger than the other set, the larger ones being used to shove the being onto her feet. The creature's height, while not titanic, would still easily tower over any human. The creature's face is somewhat obscured by a draconian mask. After a brief glance about, the creature cracks forth in maniacal laughter. "Laadan is stronger than Sill-eye and strongest there is," the creature bellows, a tone and speech both erratic and gravelly compared to the more clear speaking Zilthai. Laadan looks down at Max and snorts, crossing arms looking proudly. "You! Box Man Max, from scale of one to five, how do you rate Laadan's entrance?!" Max remembered one of John's lessons on the Imagiverse, which always passed through Max's head, as the alien describes Nod. The skeleton had described that, the further you go towards the edge, where Creator's End lies, the deeper you enter the subconsiousness of the Imagiverse. By the looks of things, this Nod is pretty damn near to the Edge. No wonder this thing's split between itself. It did surprise Max when a hand had jumped out of the circular window and... whatever else happened. The Robloxian decided it would be best not to try and think about what happened in the last few seconds. All he knew now was that a new personality had revealed itself, something that Max, with his experience with the common demons, would relate to the element of Insanity. His mouth would open and close a few times before he would respond. "I'd say a 4. It's rare that what we call "Edge-dwellers" would come here. Normally they wouldn't bother with us, possibly because they don't think we exist. The Chosen Ones are really gonna like this." The last sentence would have the tone that indicated that the fisherman had just realised his catch could sing too. As the two charged their conversation with each other, a portal opened up within the Imagiverse Center and a figure stepped out of it. As he stepped outside he would examine the area especially the people walking around. There were unicorns and ponies, strange cuboid people, walking skeletons and even animals with legs. To the figure they all looked very weak, he had received word that there was an entire world out here, some say two sisters found this world by complete accident and the nations were planning to open portals to this world. However he managed to open this up with a bit of help and was the first being from Grand Gia to willingly enter this world. He had hoped to encounter some strong people, but all he could see right now were random civilians. Maybe some encouragement will send someone with power to his location? With that in mind easing a massive axe with just one hand he would attempt to begin destroying the roads and damaging any buildings in sight. Of course the sight of him attacking out of nowhere would surely panic the residents. This would certainly draw the attention of someone. "A FOUR!? THAT. IS. Mm... fair, Laadan's landing was not the best," she says with a sudden calming of her tone. Despite being an Id, she was not entirely about rage, but rather passion. Her expression, as much as it could be called, changes to a childlike stupor, a finger to her mouth making it clear she wasn't actually paying attention. "Hedge-eh-what..? Laadan laughs at these... hedgelords! Don't... exist? Cogent agro bum, 'I eat therefor I do!' Or something like that." Despite being an absolutely inane misquote, she looks no less proud of it with head held up high. This moment was soon interrupted by a loud noise, panic and destruction. Her antennae raises up straight into the air and snaps her neck around 180 degrees. What she saw was some guy wrecking the streets with an axe. Without word, without deep inspection of the situation, impulse takes her feet and she lunges straight into the hazard zone, and fittingly slamming into a building as she does spraying debris and strange purple slime everywhere before scrambling back to her feet. "YOU," she shrieks, tongue running out like a panting beast. "Laadan was going to eat those!" Although temporarily confused, he would notice the young tyke with the axe causing havoc in the Centre. He would watch Laadan leap into the fray, whilst he would flex his muscles, grinning. Now this is gonna be good. He would walk towards the chaos, centred around the man. A Skelecoot tinkerer was quite perplexed and then very re-dead. Several clockwork companions suffered severe damage and therefore, the Innovatium cores imploded, creating the sound of an explosion in reverse, turning the already weird civilians into even weirder things. "Hey!" Max would yell at the axed maniac. "You lookin' for a fight, because you've sure as the Underworld got one!" As he says this, lights begin to span his robot arm, preparing for a pummeling. The second Kira heard and spotted the two would be heroes, he stopped his mindless destruction and turned to face them. "Quick response time, you two seem like you would put up a good fight. Heard some sisters found this place but never bothered to do much here, so I decided to see how strong the people of this world was. But you already know I am not here for idle chatting...let's see who is stronger!" He called out as he pointed his sword and axe at them. He initiated the attack first, lifting the mighty axe into the air he slammed it into the ground causing a massive shockwave to tear through the ground aimed for Laadan. He also raised his sword which was now glowing and after stabbing the sword in the ground another shockwave was sent in Max's direction. He was exited to fight these new people. Max didn't mess around. As soon as his mind quickly established the line of exploding earth darting towards him, he would fling himself to the side, letting the shockwave dart past and hit the fountain of the Centre, spraying chunks of marble across the floor. The Hand statue, known as Albert, would shudder a bit, look down at the damage, turn his finger gaze towards the fight and then return to his original position, deciding not to intrude in important business. As soon as he dodges the shockwave, Max would sprint towards Kira, winding his robot arm backwards, before he would attempt a hook aimed at Kira's head, using his momentum in the process. Meanwhile, from the other side of the street, a sea-green duck peered from behind a corner. He was dressed in a red shirt displaying a cream pie in motion, yellow shorts and blue sneakers. The overall attire would make him rather visible, but, then again, he wasn't prepared for a fight. Jack The Ducky Boy took in the scene. There was Max charging at some guy with an axe, there was the weirdest creature Jack has ever seen, and the entire street was in total chaos. He gripped a strap from his backpack. Looks like he'll have to stun whoever's causing trouble with whatever he's got. Laadan reacts quickly by lashing out her tongue, wrapping it around a street pole and, like an elastic band, snapping her back against a building where she stick to it like a gecko. The strange thing is that despite her size, there is barely any sound of impact, so oddly light on her feet. She stands up, fully horizontal to the street below her and then draws her neck back, pulling the post up from the sidewalk and... consuming it. Laadan in turn seems to become ever so slightly larger overall, like the mass of the object was added to her in some strange way. "Laadan is more than strong," she boasts as she springs off the building, colorful wing cloak flaring up brightly in the air reacting to the violence, body dripping violet ooze on the ground before changing direction abruptly coming down straight at Kira with both her large fists aimed at him. "Laadan is strongest!" As Max charged Kira, he did not dodge. Not because he did not want to dodge, but because he was not quick enough to avoid many attacks. The hook collided with Kira as his head was thrown in the direction of Max's punch, however all that really did was leave a mark on his face. He may have lacked speed but made up for it with resistance and power. "If you plan on fighting close then combo your attack like this!" Kira called out as he dropped both of his weapons and retaliated with an uppercut aimed for his gut...or at least the area where his gut would be because he was a strange cuboid person. If he landed the blow he would follow this up with a haymaker to his chest, then a knee which would send him into the air and finish it up by round-house kicking him into Laadan. He would then quickly retrieve his weapons while Max was in flight. Of course if Max found a way to avoid colliding into Laadan or avoiding his initial strike he would not be able to avoid Laadan and be forced to defend himself from what appeared to be an agile opponent. Max, due to his strength making up for his lack of speed, would be subject to one helluva combo. He would be flung in the direction of Laadan, but, because of his mass, he would just roll across the floor below the alien. Despite the beating, he is only moderately bruised. When he lifts himself up, glaring at Kira, his nose would be bleeding, his right eye slightly bruised and squinting. "That all you got?" Max would grunt, clenching his robot arm, which begins to glow. When the world stopped spinning, he would notice a punty sea-green duck sneaking carefully across the street, a seltzer bottle in his hands, pointed at Kira. Max would not attempt to draw attention to Jack, letting him attempt to do whatever the hell he's doing. Jack would look at Max, almost frozen solid in fear, and then turn his gaze and witness the alien, which refers to itself as Laadan, dart from the side of Jumbo's Artillery towards the enemy. Despite defying the conventions of weight, Laadan has some kind of force when smashing down atop Kira, cackling wildly like a child with a new toy. The force also splatters the ground with more slime that is not slick or sticky, but negates friction, objects thrown about slide out of control against the goo. "Okay, you entertain Laadan for a while, blade man," she cackles, her eyes widening. "Try not to break too quickly!" Kira would pull up his arms and take the blow from Laadan head on. He chuckled a little when the strange creature spoke and saw Max getting up still ready to fight. "Looks like this world has some tough fighters, but you are going to have to try harder than this! Vaasa Strahl!" Kira called out as both of his arms were infused with both dark and light energy. He would then throw both of his fists at Laadan to hit her, if the move did connect the move would unleash a beam of energy from his arms sending her flying. Of course if she did dodge the beam would still be sent flying colliding into any building unfortunate to be in its path. As the two figures rolled together into a ball of violence, Jack would walk up to Max, the seltzer bottle still in his hands. "What the hell ith going on?" It would be time to explain that Jack's manner of speech is rather hindered by his beak. "Ya see," Max would say, putting his tree trunk arm around Jack's shoulders. "That alien thing there's from a place called Nod, which I think is near the Edge. To be honest, I didn't catch whatever that thing was saying about it, but I think it'll breathe some life into John's skull. The alien, from what I picked up, is a schizo. When I met it, it was called," he would pause, wrapping his mind around that weird string of syllibles again, "Zi-lee-thigh, but right now, it's name is Laadan, I think." Jack would slowly nod, looking at the alien. It was definitely different to what he had encountered before. True, he never sees Edge-dwellers often, and was glad for it. You'd never know if a seemingly harmless creature was in fact a minion of the Maelstrom, God of Chaos. The thing he was seeing now certainly wasn't harmless, but it didn't look like a Stromling either. Quite often, it would have to have fountains of black tar-like substance in place of it's eyes, and it had to look like the work of a rather questionable taxidermist. None of which seem to apply to this gooey near-transparent thing that was currently assaulting this bladed vagabond. "And who'th the lunatic?" Jack would say. Max would turn to Jack. "No idea." "Oh, that is pret-," Laadan begins to say before being blown back, spraying slime about. She is hurled through the air, slamming against the corner of a building then bouncing against the walls of an alley before falling into a dumpster and the lid closes atop her. After a brief silence the dumpster begins to rumble and a dark violet streak shoots through the top of it, and Laadan lands on top shaking off a banana peel from her head, eyes aglow like a wild beast, dark and light residue remains flowing upwards like smoke. "No, no, no! Laadan does not eat garbage, this is... is... filthy!" In her rage she extends out her winglike cloak. glowing brightly and she gets down on all six like an animal, maw open and growling. She takes off, charging fully vertical against the wall before launching at Kira again, this time swinging at him with her long tail. "Blade man! You ruin Laadan, now Laadan ruin you!" Kira looked at the slime being thrown around. As Laadan was thrown back and landed right in a dumpster he took a moment to check out the slime. It was not sticky, but it was not slick either. It was like ice only not ice. Whatever it was it would make him slip out of control, and that was not something he should fight on. But before he could get to clearing all this slime, Laadan emerged from the dumpster with light and dark residue surrounding her. And she seemed to go into a raging state. As she went to hit Kira with her long tail, he raised his axe to defend himself. As the blow impacted him he was send skidding backwards but worse of all onto that slime. Instead of skidding for a few feet maybe a yard he was sent skidding yards away from her and crashed into a building. He quickly recovered from the attack and cracked his neck a bit. "Now this is a challenge! Dispair!" Kira called out as he raised both his axe and sword into the air before bringing it down and shattering the ground beneath him as a wave of energy like a massive tidal wave was sent forward seeking to destroy all in its path. "Well," whispered Jack to the Robloxian. "Thith thure ith imprethive. At leatht we're not in it." "Oh, I don't know about that," replied Max. "Pretty soon, we might have to intervene. Someone could get hurt." The Chosen Few are not, by definition, heroic. They do not charge into someone else's fight, even if it's for the safety of the local area, if they don't feel like it. They've seen so much action and horror they've become rather desensitized. This is mostly because whoever, or whatever, they fought, they defeated by a landslide. Many years of experience had toughened the group into a band of capable, if less than enthusiastic, defenders of the Imagiverse. Of course, they never heard of Grand Gaia, except Adam Skelecoot, who had the pleasure to meet a pair of musician warriors, who were the first in their world to stumble across the greater-scaled realm of Fantasy. Having seen the confrontation in Armourer's Place, which was at the risk of having a fireworks display occur if any of the stock were disturbed, Adam Skelecoot, the skeletal quarter of the Chosen Ones, decided he would take Equestrian Avenue and turn at Skull Lane to meet up with the rest. He stepped beside Jack, crossing his yellowy-white arms. "That the alien?" He'd say in his default South-English accent, pointing at the pissed alien thing. "Yep," said Max conversationally. "Quite a toughy, by the looks of things." "Did you ask it the "Friend and Foe" thing?" "Yep, and it is negotiable." He would pause for a moment. "Well, the one that I talked to, anyway." The skeleton would turn to Max, his expression that of mild puzzlement. "It'th got multiple perthonalitieth," explained Jack. They would continue to watch the fight. "Despair," Laadan mutters, her antennae/tentacles wiggling in frustration, twisting her large right arm, with the lack of bones her arm just winds up in a spiral. "Laadan knows despair, despair and fear, knows it too much! It made a void inside, then Laadan ate it all up and got sick, and then only rage remained!" With this Laadan does not dodge the attack, but instead charges directly at it, absorbing the debris that is flung against her, slowly gaining size then swinging her loaded right arm forward with it spinning wildly, splitting the air itself with one loud thunderous crack. She planned to plow straight through without any self regard. Kira watched as the creature charged through his attack, the wave on energy did impact the creature however unlike its surroundings which was being blown away or obliterated entirely it could walk through with some injuries. Seeing as how the creature was still standing, Kira sneered in irritation. He was supposed to be the stronger being here! Not that creature! Kira raised both his weapons and got ready to ramp up. "I will not lose here! If I have to demolish this entire town to destroy you so be it! Dämonische Licht!" He yelled out as his body was consumed by light and dark energy. It was clear that he was not just a regular man. Two horns grew from the sides of his head, one light and one dark. It was clear that he was associated with demons. "Time to get serious here! I will crush you! Xeno Verto!" He called out as he charged forward, his weapons glowing with raw power. The wave he had sent earlier has dissipated along with many buildings in its wake. Laadan's ethereal tongue hangs out, panting, one of the horns of her boney plate mask cracks off dissipating into nothingness, hairline fractures spreading downwards to the eyehole. The strength of the attack coming her way was formidable, she couldn't just punch through it. But something else flooded her mind, took priority over everything else: she was not returning to Nod, not to the place she was before, she had gone too far to crawl out of the depths, out of the emptiness that was her prison. Freedom tasted too good. "Laadan is not going back," she roars, a sudden shift upon the spacial fabric displaces a small chunk of the city around her, including buildings. It was not like it was destroyed, exactly, the structures remained intact without crumbling, and a phantom-like imprint remained of the objects that once existed there, it was like what was consumed now was a wobbling three dimensional photo negative. The immediate surge pushed Laadan further, growing again, looking more monstrous than before, the boney mask more toothy and savage, her claws more pronounced, she looked like some bizarre alien dragon. The runes on her body glowed with a ghostly blue light, her eyes fuming with green smoke, that whimsical and playful Laadan has been replaced with something more primal: the desire to be. She slams down her smaller claws into the ground, then swings her larger ones together like a clap to clash against Kira's attack. "Laadan will not be forgotten, not again!"